One of the greatest challenges in transmitting divine truth is to make things that are theological understandable; to make things that are theological practical. God’s intention is to make the theological practical, while also intending that the practical direct us toward the theological. God desires that His very theology be practiced in our lives, and that all that is practiced in our lives lead us to Him. For example, coffee should lead us to God. Consider how many persons it took to bring a cup of coffee to you. There are the people who grow it, who farm it, who roast it, and the barista who hands it to you, and there is also the very soil from which it grows. God’s allowed us to have coffee so we can do stupid things faster with more energy. If we consider all that is involved in our single cup of coffee, we cannot help but be led back to God and to give Him thanks for the coffee that enables us to do those stupid things faster with more energy. Today’s message is essential in that it is deeply connected to our spirituality as Fathers of Saint Joseph, to Saint Joseph himself, to the human family, the Church, society, and especially the father in the modern world. Today we will dive deeper into the theological, with the hope that by the end we will have a highly practical application. The first key theological principle is this: What God is and does in eternity, He also desires to relive, reveal and replicate in our humanity. So who is God? God is an eternal exchange of persons—three persons so self-giving that they are essentially and eternally one. God is a perpetual, continual, eternal outpouring of love, and it is God’s intention that this love be replicated in our humanity. God’s essence and glory is self-giving love. To help us understand more clearly how divine and difficult it is to achieve God’s glory, we can consider this question: Have you had one relationship, just one, in which you have lived perpetually in disinterested—that is, unselfish—love, giving yourself to another without ever being selfish or ever sinning? I haven’t. That is what God does and who God is, and what He desires to express in our lives. God eternally gives, and gives, and gives, and it is His intention to replicate this never-ending giving in our humanity. As Pope St. John Paul II said, God is a family. God is Trinity, family, relationship, and communion, and He desires that His divine family be relived in our human family. God created marriage and the family as the means, as the context in which he can express his Trinity—His self-giving love. He created men and women with an inherent need for one another, and by addressing this need they become one flesh in the child that is the fruit of their union. It is this child, the third, that enables their family to be an image, a reflection of the Trinity. God created Adam and Eve with this mission to replicate, relive, and reveal God’s Trinitarian love in their humanity. Adam and Eve were called to come together in the one-flesh union and to produce a third while in the sinless preternatural state. If that occurred they would have become a living, breathing icon of the Trinity, capable of transmitting God’s self-giving love throughout the generations of human history. But they failed. And the result of this failure was sin, blame, death, and shame. But that wasn’t the end of the story. Fast-forward to the New Testament, particularly the first chapter of the Gospel of Matthew, wherein on two occasions this phrase is used: “These are the origins of Christ.” The Greek word for origin is genesis. “These are the geneses of Christ.” In other words, St. Matthew is highlighting that this is a new beginning in the history of mankind. In fact, toward the beginning of the Gospel of Luke it says that “in the sixth month” the angel Gabriel announces the Incarnation of Christ, the new man. Luke is correlating the sixth month of Elizabeth’s pregnancy with the sixth day of Creation. Man was originally created on the sixth day, whereas the New Man is created in the sixth month. The original man was not intended to remain in the sixth day with the beasts, but was intended to live for the seventh day, a day of Covenant with God. Likewise Christ, created in the sixth month, fulfills the New Covenant with God and thereby allows every man to be sanctified—beginning with John the Baptist—in the seventh month, which symbolize the seventh day of Creation. In other words, there is now a new re-creation, a new origin, a new genesis. But there is a fact that can easily be overlooked. Just as at the beginning there existed the original Adam and Eve who brought forth sin, in the fullness of time, at the dawn of a new age, there existed a new Adam, St. Joseph, and a new Eve, Mary, who brought forth a son, Jesus Christ, Who is grace and truth (John1:14). This marriage of Mary and Joseph becomes a portal of grace through which grace comes to the human family. Consider that God could have chosen to allow Mary to conceive the incarnate Word outside of the marriage of Joseph and Mary, that is, before she entered into the marriage covenant with Joseph—but he didn’t. God intentionally chose to allow the Incarnation of Jesus to occur only after Mary and Joseph were betrothed to one another. The betrothal officially was the first stage of Jewish marriage. God, predestined Joseph to be part of the plan of rescuing humanity from sin. God did not choose only Mary, but rather Mary with Joseph. This is extremely important. Consider the words of Pope Paul VI: “We see at the beginning of the New Testament, as at the beginning of the Old, there is a married couple. But whereas Adam and Eve were the source of evil, which was unleashed on the world, Joseph and Mary are the summit in which holiness spreads throughout all over the earth [where Jesus’ death and damnation were introduced by a virginal sinless couple], the savior began the work of salvation by the virginal holy union, wherein is manifested, his all-powerful will to purify and sanctify the family.” In other words, whereas through Adam and Eve and their disunion came forth sin, through the new Adam, St. Joseph, and the New Eve, Mary, came forth a Son. It is through their holy, virginal union that grace and truth flows to all our families, so that we may be purified and sanctified and reflect the goodness of the Trinity to this world. Pope John Paul II says it this way: “The marriage of Mary and Joseph conceals within itself at the same time, the mystery of the perfect communion of persons of the man and the woman and the conjugal pact. And also the mystery of that singular continence for the kingdom of heaven: a continence that served in the history of salvation, the most perfect fruitfulness of the Holy Spirit.” So the point is this: Mary and Joseph have the most perfect communion of human persons expressed in free, total, self-giving love. It is from this holy union of wills with one another and with God that they “drew down” from heaven the perfect fruitfulness, Jesus Christ, and thus they become an icon of the Trinity. Because of these new parents of our race, the iconic presence of the Trinity can be transmitted to each and every one of our families. Another way to express this truth is that typically Muslims believe that they pray and worship Allah, and have no need for Jesus Christ, and Protestants believe that they go to the Father, through Jesus, but have no need of Mary or her intercession. Catholics go to the Father through Jesus, in the manner by which Christ came to humanity—by means of Mary. Mary leads us into the heart of Jesus, and Jesus leads us into the heart of the Father. However, there is something more to God’s plan, and something that most people overlook altogether. Catholics tend to hyperfocus on Mary alone—but Mary herself indicates that this is not reality . Mary herself is pointing us to Joseph, and their union of wills, their marriage, indicating that it is through these parents that grace flows to humanity. As St. Paul says, “The gift and the call of God are irrevocable” (Rom. 11). God didn’t just use Mary and Joseph and their marriage as a singular event in human history. No. God is all about inclusion.. So he assigns, appoints, perpetual parents, Mary and Joseph, for our human family. The gift in the call of God is irrevocable. God does not revoke the gift, the call, their vocation, but rather deigns that grace perpetually flow through this portal of their marriage. In fact, Jesus says, “What God has brought together, no man must separate” (Mark 10). Grace builds upon nature. God will not separate the human marriage of Mary and Joseph, nor will he dissolve this union in the order of grace because it’s vital and intrinsic to the plan of salvation. Why is this important? Because God is family. He wants to replicate and relive and reveal his family in our family. And how does he do that? By creating a new family with Mary and Joseph as our parents. This dynamic is foreshadowed powerfully in the event of the Presentation of Christ in the temple, commonly referred to as fourth Joyful mystery. According to the Law of the Lord, every firstborn male who opens up the womb is to be consecrated to the Lord. This was demanded of the Jews because of their worship the golden calf. From that point on, God demanded that they give their firstborn child to Him, and that the parents would offer a sacrifice to ransom the child back. Mary and Joseph fulfill this command by taking the newborn Jesus to the temple to consecrate Him to the Lord. Notice that the couple receive God from God in the Child Jesus. However, they take this gift of God to the temple, and they give God back to God. And how does God respond? God returns God to Mary and Joseph, entrusting them to raise and give this gift of God to the world. Jesus eventually sacrifices Himself to give birth to the Church, and brings that Church into union with Himself through the marriage of His human parents. The point here is this: We are called to live the Imitatio Christi. We imitate Christ. What Christ did, we try to replicate in our own lives. Christ ordained that Mary and Joseph present Him to the Father and in a certain sense raise Him as an offering to the world. Therefore, we also, through Jesus, in Jesus, and with Jesus, allow ourselves to be presented by Mary and Joseph to the Father. This spirituality and theology is embedded in the psychology of the Church. Consider that many Catholic churches have an image or statue of Mary and Joseph flanking the side of the sanctuary—in the center—where our Lord Jesus in present in the Eucharist. In other words, this represents the fact that through Mary and Joseph’s marriage, Jesus is conceived. It is during Holy Communion that we approach Jesus, receive Jesus, and in Jesus, with Jesus, and through Jesus, we’re given to the Father through the portal of Mary and Joseph’s union of wills. We need Joseph and Mary in order to give ourselves fully to Jesus—to be given fully, in all humility, to the eternal Father. Now, when I was contemplating all this, a question arose in my heart: How does this theological development square with the event of Calvary? Mary alone was present at the foot of the cross, giving Jesus to the Father— Joseph was absent, therefore Joseph is ancillary to the divine plan. Keep in mind, however, that Joseph is appointed to be an icon of God the Father. It was God the Father, Who during the Passion and Crucifixion of Jesus, hid Himself from Jesus in order for Jesus to fully embrace His sacrifice. God did not abandon Jesus, but deemed it essential that He remain hidden from Jesus. Why? The answer is highly relevant, practical and meaningful to every father. Jesus had to fully embrace His sacrifice so that he could move from sonship and proceed to become a spiritual father who begets life to His family. Only by embracing His sacrifice fully could Christ obtain for us the gift of becoming sons of God. It is not as though God did not aid Jesus, His Son, in his time of trial. That would be a lie. The Father did indeed provide angelic assistance, Mary’s support, the love of the women bewailing Him and lamenting Him. Jesus, however, must embrace His sacrifice completely as His own. This is why Joseph cannot be at the foot of the cross. If Joseph was present at the time of Jesus’ Passion, being the just, faithful, sacrificial father that he was, he would have, by duty and love, sacrificed himself in place of Jesus. God could not allow Joseph to be present at Calvary for this reason. Joseph as icon of the Father, rather, is in the bosom of the Father, with the Father, offering Jesus, in hiddenness and secret. How does this affect my fatherhood? For each and every father, this is the moment of crisis. In the Greek, krisis means verdict. Verdict is when the truth is made manifest. It is in the moment of krisis that the truth of whether or not we trust God enough to abandon ourselves to him, believing that he hasn’t abandoned us, is manifest. We encounter this type of krisis in raising our children. We invest in them, give ourselves to them, preparing them and building them, while never doing for them what they can do for themselves. We must invest in them, but we should never do for them what they should do for themselves. If you and I desire our children, especially our sons, to grow up to become true men, true fathers, who can beget spiritual life, we must never perform their sacrifice for them. If we are welfare dads, who do for our children what they should do for themselves, they’ll never become who they’re supposed to be. At an early age, our children attempt to walk, and we’re holding their hands with our fingers. Then we release their hand, step back, and let them take a couple of steps on their own. As they become stronger, we distance ourselves from them, letting go, for the purpose of their becoming independent. The son says, “Dad I wanna ride the bike. Take off the training wheels.” Okay. But you know, initially, that it is your responsibility to hold on to the back of the seat until the child is ready for you to let go. You teach your son how to hit a baseball for the purpose of playing and competing in a real game. You teach your son how to love woman. He hopefully learns how to love a woman without lusting. You get the idea. Our job as fathers is to invest in them, but the moment of crisis for fathers is letting go and letting them become who they’re really called to be. This can be very, very difficult, because there are going to be scraped knees, crashes and wipeouts, strikeouts, breakups and divorces. During such moments we will be gravely tempted to step in do it for them—but we can’t. Certainly, it is imperative that we stand alongside them, encouraging them and praying for them—but we can’t do for them what they need to do for themselves. And what about us? We all have moments of crisis, don’t we? We all have moments when employment isn’t going so well. Perhaps we are struggling to pay the bills. Maybe our marriage is crumbling. Perhaps we believe that we’ve fallen in love with another woman. We all have these crises. We all experience them. The moment of crisis is the moment that the verdict falls. That’s the moment of truth. Will we abandon ourselves to the Father, believing that he has not abandoned us? Or do we cry out, “My God, my God, why have thou abandoned me?” believing that God has cast us aside. And if there is any question, Jesus didn’t believe God abandoned him. When he said, “My God, My God, why have thou abandoned Me,” He was quoting Psalm 22. 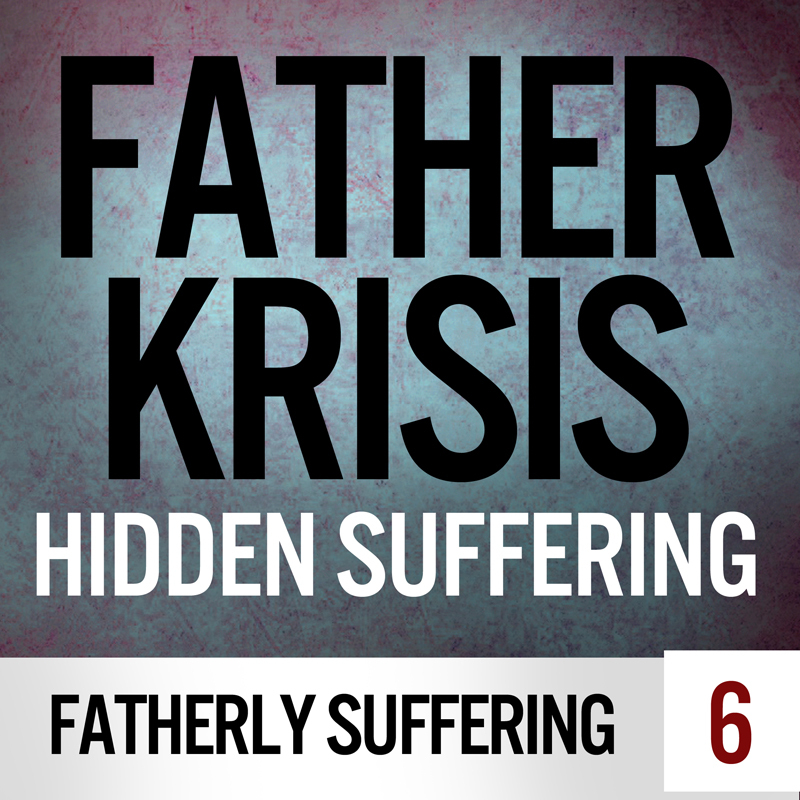 Proof of His relentless trust and faith in the Father is evident in His words, “Father, into thy hands in commend my spirit.” In Christ’s darkest hour, His moment of crisis, He completely trusted His Father. Our moment of truth is when we discover whether we trust God during a crisis. That’s the verdict. Let’s return, for a moment, to the event of the Presentation of the Child Jesus—the moment of Joseph’s crisis. Recall that Simeon prophesied, saying, “This child [Jesus] shall be the rise and the fall of many in Israel. He shall be the light to the nations.” Then Simeon address Mary—as if Joseph no longer exists—You woman, “a sword of sorrow shall pierce your heart, that the thoughts of men may be made known.” Consider the thoughts and emotions occurring in Joseph’s heart. What do you think he was feeling? Joseph must have experienced a deep angst, realizing that he was not going to be present in Mary’s moment, in the moment of His Son’s crisis, to protect them from this sword. It was here, in this moment, that Joseph’s heart was pierced. Joseph’s sacrifice was in relinquishing his duty to protect Jesus and Mary, surrendering that desire to God and His providence. The practical point of this is that this is our moment of crisis, also, when we surrender all to God, acknowledging that we are not in control of our children’s destiny. The second practical point that we can glean from this is that a new age is upon us. I believe that we’re experiencing a theological unfolding—an unfolding of theological doctrine regarding St. Joseph and the Holy Family. St. Augustine compared developing theological doctrine to a rose that is closed. When the rose opens and blossoms, it appears different. You can see inside that rose, and see more of it—although it is the same rose. Indeed, we are witnessing an unfolding, a blossoming of the divine truth regarding Saint Joseph, the Holy Family and their marriage, as the portal of grace and truth. Consider that Our Lady of Fatima predicted on the third and fifth apparitions to the three little village children that St. Joseph is going to come. If I was one of the visionaries I would most likely think, “So Joseph is going to come. Big deal. You’re the Mother of God. Why do we need Joseph?” But Mary was adamant, saying that Joseph will appear during the sixth apparition. Notice that is will be the sixth apparition. There is a direct correlation between the sixth apparition and the sixth day of Creation: just as Adam the original man was created on the sixth day, there will be a new man who will appear in the sixth apparition. It was during the sixth apparition, while seventy thousand pilgrims looked on, drenched with rain, standing in muddy fields, that they witnessed the sun zigzagging across the sky and suddenly descending upon them. Believing that they were going to die, the pilgrims began to cry out, confessing their sins, and calling out for God. It was in this moment, while the three little children were in ecstasy, that the visionaries saw St. Joseph and the Child Jesus blessing the world. During the blessing the sun returned to its original place in the sky and Mary appeared with Joseph and Jesus. What’s the point? Mary was saying, “Everyone listen. How will the world be saved from destruction? By going to Joseph, who is with me. And when you fathers learn to follow his example, your family will be like my family—holy. Fathers, learn from the timeless wisdom and the ageless example of St. Joseph. Learn from him how he embraced silence and lived a life of prayer, hearing and responding to God’s call in his life. Learn from Joseph how he embraced woman, and overcame temptations to lust. Learn from Joseph how he embraced his child, protecting, providing, and leading Him. Learn from Joseph how he assumed his charitable authority and led his family to righteousness and holiness.” I believe that this is the essence of Mary’s message: “Go to Joseph. What he says, you do.” We are living in a new age in which heaven is calling our attention to Joseph. If we desire to be holy, if we desire that our families be holy, if we desire to be reflections of the Trinity, if we desire that what God does in eternity is reflected, revealed and relived in humanity, then we go to Joseph and what he says we should do. Indeed, we need to go to Joseph because Joseph will lead us into the heart of Mary, because Joseph took Mary into his home and into his soul. And Mary pondered the mysteries of Christ, as the scriptures say. She leads us into Christ, who is a definitive revelation of the Father, who says, “When you see me, you see the Father.” By humbly following this progression, we find ourselves in the heart of the Trinity. Through Joseph, through Mary, we begin to truly know Jesus and to understand the Trinity. God wants your family, my family, to reflect the image of his Trinity, His self-giving love.